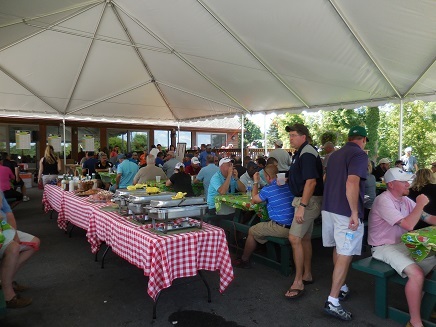 A golf tournament is an excellent way to thank your customers for their business or to boost morale with your staff. There's nothing like a beautiful day out on the golf course with no phones, green grass and fresh air. They say many a business deal has been made on the golf course. 40 � 144 golfers. A shotgun start will be used for groups over 40 golfers. References are available upon request. Contact Joan at the pro shop at (518)792-4144 or via e-mail CLICK HERE. We will prepare a quote for you upon request and offer our Tournament/Outing Menu which includes Lunch on the Turn, Breakfast, Picnics, Dinner & BBQ choices. We also offer Open Bar and keg sales. All food is prepared on site by our cooks and is substantial and delicious. We also have a full bar. If we don't quote everything that you want just ask and we'll see what we can do. You may choose to eat in our clubhouse tavern serving approximately 60 or outside on our attached deck seating approximately 30+. 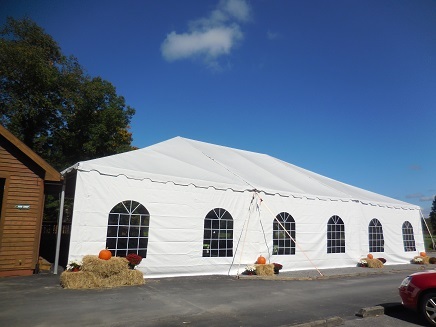 The tournament tent will likely be your preference if you are a larger group. It can seat up to 150 guests. When golfers get a chance to be outside they generally want to stay outside. All services are offered including assisting you in planning for the event, assisting or running registration � your choice, competition set up, starter/ranger service including, running out of your sponsor signs if you have any. We offer to prepare a Player Note describing format, competitions & rules for the day, announcements, and we can do scoring for you. If you have never put together a golf tournament we can share with you our checklist that will assist you and maybe give you some new ideas. Come enjoy Airway Meadows G.C. with your group for a friendly challenge on the links with helpful welcoming staff to assist you. It'll be a Fun Day!